ActCAD is available at very low price with permanent validity of licenses. No need to pay annual subscriptions. Upgrade to future version is optional. Try, Believe & Buy only if satisfied. ActCAD has many add-on features like LH Sections creation, Units converter, Drawings Auditor, Batch file converter, Attributes extractor, Block Library with over 5000 symbols etc. ActCAD is now available with Artisan Professional Rendering package at no extra cost. Photo-realistic rendering, 360° viewing, lights, materials etc. available. ActCAD offers free technical support to all its users, no need to buy any Support packs. Submit support tickets directly from ActCAD or on Support Page. Queries will be replied either on same or next working day. ActCAD allows License Transfer from one computer to another using simple command over Internet. There is no limit on number of transfers and number of computers. One license can be floated between multiple computers. ActCAD users can develop their custom programs to work inside ActCAD using .NET, SDS, LISP, DCL and C++ languages. API kit comes with many sample programs and solutions. Free support not applicable on Customization tools. You can open any vector PDF file directly and edit the entities in ActCAD. Raster images also can be converted directly to DXF in ActCAD. ActCAD comes with a Block Library with over 5000 symbols in Civil, Mechanical, Electrical, Architectural, Structural and other domains. Double click on any symbol and insert into your drawing. ActCAD is easy to learn and use. 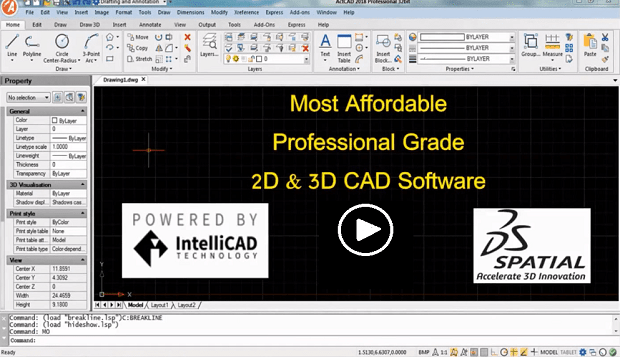 ActCAD incorporates a user interface, commands, icons and shortcuts similar to many other CAD programs. What's New in ActCAD 2019? In General it is an equivalent alternative for AutoCAD. it is light, reliable and satisfy the needs.The software is small no need for heavy installation. Its innovative product on ITC IntelliCAD Technology engine 8.4a for CAD, civil engineers, designer. The program offers the same functions as much more expensive products. A good product... with ease of operation with excellent customer support. Value for money Layout and commands are similar to AUTOCAD thus learning curve is short.